I agree with the general sense of what Craig says here. I have some theological/ecclesiological reservations about the shape of many mega churches, yet I hesitate to write them off. And so I argued in that same post (admittedly in a reserved fashion) that megachurches have their place within the landscape of N American Christianity. I said: “I believe the work of the mega churches is valid and has its place in the Kingdom: the ministry to the dormant unchurched of Christendom..” As Christendom wanes however, that work will become smaller and smaller. It is for this reason that I like what Craig Carter is saying above. In some ways we might compare the place of mega-churches today with the place of cathedrals in medieval Europe. Cathedrals were at the center of Christendom. To this day, in each town in old Italy, you will see the vestiges of the town square in front of the Cathedral like church, the steeple being the highest point in the village, and all the roads leading to the church. In this pre-modern time, the church bells kept time, the daily office, and the festivals were all holy festivals that were conducted to and from the church. These Cathedrals represented a society where the language was Christian and the church was at the pinnacle of power in society. It made sense that cathedrals were “attractional.” I believe many of the same conditions necessary for Cathedrals are indeed necessary for mega churches. I believe mega churches are dependent upon the sociological conditions of Christendom. Although Craig Carter’s teacher, John Yoder, would wince at the integrity of such a structure for God’s people, for these times and places, I want to grant at least some legitimacy to this historic way of being church. Alongside these cathedrals however, monastic orders of various types arose. During particular times of church history when the church fell into decline, when society was taken over by “the barbarians, it was the missional orders that carried on the faith. Mission was best conducted by these missional orders and some of them were even commissioned by the Cathedral churches (Rome). These missional orders were not attractional. They almost always had flexibility and movability to their structure. Of course these orders often got in trouble with the Cathedral (Rome) church when they called the Cathedral church back to holiness and faithfulness. Today, I can see the missional church movement as having this same kind of flexibility and movability necessary to do mission in North America whereas the mega church does not. I see the Cathedrals/mega churches as too often seduced by power. I claim it is inherent in the structure. I see that Cathedrals often fell into “servicing” a Christianity that was lowest common denominator. I see mega churches as prone to the same. I see Cathedrals/mega churches as prone to all the problems of institutionalization including inflexibility and immovability. The missional communities can do grass roots community like mega church/Cathedrals never could and never can. All of these weaknesses however do not delegitimate the Cathedral church’s role in Christendom society, sometimes powerful in every way. The question is, is Christendom good? And are we at that same point in the decline of the Cathedral Christendom church (evangelical mega church) where it needs to be called back to faithfulness? I think Christendom has its big problems. I think it’s on the decline anyways. I also think today that many of the mega churches have fallen into the same bad habits as the Christendom Cathedrals of the past. I therefore see the missional church movement as being a renewal ecclesiological movement in relation to the mega church movement, much like the monastic orders were to the Cathedral church. This post has been much too simplified. But thanks to Craig Carter for his idea so germane to the missional discussion. He knows much more about pre-Reformation history than I. And he knows John Howard Yoder better than I. So I’d be interested in his take on this analogy. What do you think? In what ways do you see this analogy as fruitful for the missional church/mega church discussion? 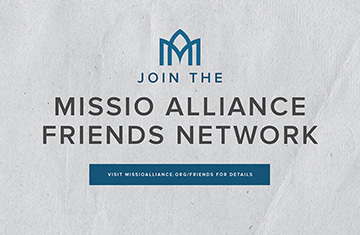 How do you see missional communities/ mega churches, emerging churches/denominations working together? ANNOUNCING A MISSIONAL NON/CONFERENCE - SEEDING MISSIONAL COMMUNITIES A Learning Commons January 3rd 8-4 p.m.